Forfar Athletic’s grip at the top of the table was made more secure with a slender goal victory over Annan at a sun drenched Galabank on Saturday. It was a fine advert for a match at this level with the result in doubt until the final whistle. Forfar were very much on the back-foot in a first half where Annan played some excellent football and the home team were rewarded with a goal scored from the penalty spot in the 20th minute but the league leaders responded superbly to overturn the deficit with a determined second half performance which saw them secure the points scoring twice to overturn Annan’s first half lead with the winning goal coming six minutes from the end. The Annan starting line up showed one change from the team which secured a point at Montrose with Steven Swinglehurst replacing Jean Guy Lucas. Annan started the match very much on the front foot and and in the opening minutes Cuddihy and McKenna both had promising shots. Blair Currie had to be alert to cut out a fine cross aimed for the head of Jim Lister in the 13th minute. Annan wet ahead from the penalty spot in the 20th minute and it was a cheap goal for the visitors to lose when centre half Stuart Malcome upended David McKenna after an inviting free kick to the heart of the of the Forfar defence and the clumsy challenge by the central defender denied the Annan striker a shot at goal. Max Wright converted well from the spot. Darren Ramsay’s volley from the edge of the box in the 26th minute went close followed by a Wright effort which flashed over the bar. 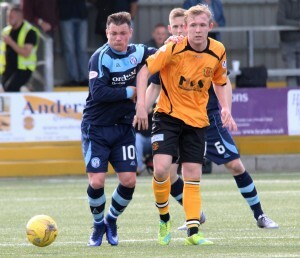 It was a purple patch in the game for Annan with their swift passing game stretching the Forfar defence. The visitors after being put under the hammer for the vast majority of the half finished the half on the attack and the Annan defence had to withstand some probing attacks by Forfar attack but they failed to penetrate the Annan defence. Thomas O’Brein’s 35 yard free kick in the 36th minute was a disappointing effort but it was the closest that Forfar came to opening their account. It was a more attack minded Forfar who started the second half with Annan having to sit deep in order to refrain Forfar’s increasing pressure. Jamie Bain signalled the visitors intentions when his well struck shot from the edge of the box went narrowly past. Lewis Milne was denied a goal in the 57th minute when his well struck shot struck the crossbar. With Annan inviting pressure on them it only seemed a matter of time before they would concede and following several corner kicks Andy Munro headed home Milne’s corner in the 60th minute. It was a moment in the game when Annan keeper Blair Currie will want to forget as he failed to put pressure on the corner kick with Munro heading home from 3 yards out. Annan’s Darren Ramsay then was denied by a brilliant save from keeper Adam Grant who tipped the effort over the bar in the 62nd minute. Former Annan player David Cox tried his luck in the 75th minute with his shot going narrowly past the post. Annan sqaunderd a glorious opportunity to go ahead in the 80th minute when they broke down the right when substitute Aiden Smith skipped past a challenge on the half way line to set up Barry Cuddihy one on one with keeper Adam Grant but somehow Cuddihy’s effort slipped past the upright from close range. It was a costly miss from Annan as 5 minutes later Forfar secured the points with a simple goal when a ball swung in by Michael Kennedy from the left was perfectly weighted for Lewis Milne who had drifted behind the Annan defence and in acres of space he slotted into the net from 6 yards. It was a harsh lesson for Annan and once again their defensive capabilities were put into question. The early signs are that like last season they are conceding more goals than the teams around them putting increased pressure on their ability to score more than they concede. ANNAN ATHLETIC : Blair Currie, Steven Black, Steven Swinglehurst ( Jean Guy Lucas 84 min) , Raffi Krissian, Peter Watson, Barry Cuddihy, Rabine Omar, Ryan Finnie ( Willie Robertson 90 min), David McKenna ( Aiden Smith 65 min), Max Wright, Darren Ramsay .Substitute’s not used Alex Mitchell, Adam Ashgar, Tony Ribeiro, Liam Park. FORFAR ATHLETIC : Adam Grant, Jamie Bain,Michael Kennedy, Andy Munro, Stuart Malcome, Thomas O’Brein, John Peters ( Alan Smith 91 min), Lewis Milne, Jim Lister, David Cox, Danny Deholm,.Substitutes not used – Brett Long GK, Marc Scott, Martyn Fotheringham, Matthew Aitken, Frankie Devine, Murray Mackintosh.